Severe thunderstorms toppled trees in parts of D.C. and Northern Virginia and lit up the sky with lightning Friday afternoon. A tree sideswiped a Metro car on the Orange Line just before the Dunn Loring station, said Twitter user @kristylynnluka, who was on the train at the time. The "driver is doing a great job handling it," she said. Blue/Silver Line: Expect delays in both directions due to delayed Orange Line trains. Orange Line trains single-tracked between West Falls Church and Vienna. Riders were told to expect delays in both directions on the Orange, Blue and Silver lines. Single-tracking ended about 7:50 p.m. 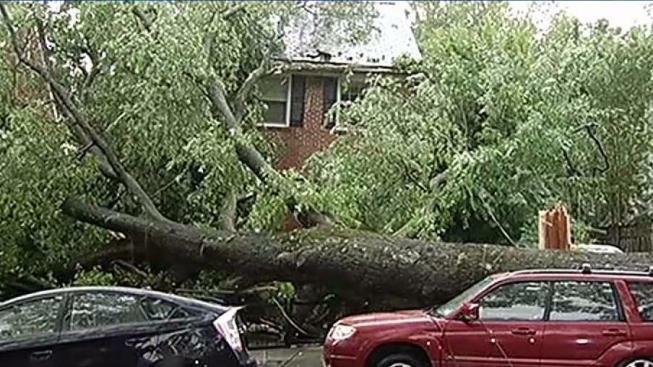 In D.C., a tree fell on a house in the 5300 block of 32nd street in the northwest section. The residents were evacuated; there were no injuries, D.C. police tweeted. As of 5:40 p.m., Dominion Virginia reported 18,438 customers without power, including 8,000 each in Arlington and Fairfax counties and 1,000 in Alexandria. Pepco reported 3,534 without power, including almost 2,500 in Prince George's County and 500 each in D.C. and Montgomery County. BG&E had 460 customers without power in Prince George's County. A severe thunderstorm watch remains in place until 9 p.m. for Calvert, Charles and St. Marys counties in Maryland and King George County in Virginia. After the rain clears, the region will get some much needed relief from the heat. Temperatures Saturday and Sunday will stay in the upper 80s and low 90s. But the heat returns next week! Temperatures will be in the 90s throughout the week.